At least 26 people, mostly soldiers, have been killed in a series of attacks by Islamist militants in the north of Egypt's Sinai peninsula. Most of the casualties were in the provincial capital, El-Arish. Militant group Sinai Province, which changed its named from Ansar Beit al-Maqdis when it pledged allegiance to Islamic State, said it carried out the "extensive, simultaneous" attacks. Egypt's president cut short a visit to Ethiopia because of the attacks. They represent some of the worst anti-government violence in Egypt for months, and indicate a previously unseen level of co-ordination, correspondents and analysts say. The US condemned the attacks, saying it remained "steadfast in its support of the Egyptian government's efforts to combat the threat of terrorism". Insurgents have intensified attacks since Egypt's Islamist President Mohammed Morsi was ousted in 2013. Tensions have also been raised across Egypt this week amid protests marking the anniversary of the 2011 uprising that ousted then-leader Hosni Mubarak. Security officials said rockets were first fired at police offices, a military base and a military hotel in El-Arish, before a car bomb exploded at the rear gate of the military base. Several army checkpoints in the city were also targeted. Newspaper al-Ahram said its El-Arish office - which is opposite the hotel and base - had been completely destroyed. Four soldiers were wounded in an attack at a checkpoint outside El-Arish and an army major was later shot dead at a checkpoint in Rafah, medical and security sources said. More than 50 people were wounded in Thursday's attacks. North Sinai has been under a state of emergency and a curfew since October, when an attack on a checkpoint killed dozens of soldiers. The army has launched major operations to try to quell violence in the region, but has so far failed. 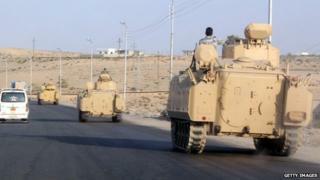 Sinai Province has become the biggest threat, staging many attacks on security targets. The group, which was originally inspired by al-Qaeda but pledged allegiance to Islamic State in November 2014, has called on Egyptians to rebel against President Abdul Fattah al-Sisi. President Sisi is the former military chief who led the crackdown on Mr Morsi's Muslim Brotherhood. The Brotherhood has said it rejects violence. Egypt is creating a 1km (0.6-mile) buffer zone along the border with Gaza in a bid to stop militants smuggling weapons in from the Palestinian territory using tunnels. The project has displaced more than 1,000 families in Rafah and severed an economic lifeline for many Palestinians.